Winter is coming and the idea of taking a hot bath by candlelight may seem tempting for many of you out there. 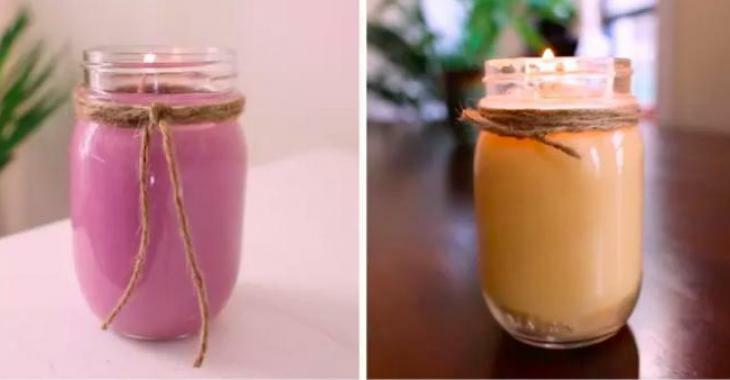 Buzzfeed website has published a way to create your own scented candles. 1. Fill a glass measuring cup with 2 cups of soy wax. 2. Place the measuring cup inside a large pan, on the stove. 3. Fill the large pan with ¾ water. 4. Allow the water to boil and the wax to melt, stirring occasionally. 5. Pour 2 extra cups of dry wax into the melted wax. Let the wax melt. 6. Remove the glass measuring cup from the boiling water. 7. Add the essential oil and candle dye to the melted wax. Stir. 8. Pull the wick of the candle through the pen cap to secure it. Place inside the Mason jar. 9. Carefully pour the wax into the mason jar. Let the wax dry overnight.